I know I've been MIA the past couple days and I'm sorry. I've been really icky lately with a head cold, sore throat, and the feeling like I got ran over by a truck. I hope I'll get better soon and will have more energy to post. For now I wanted to share with you something I am seriously crushing on right now. 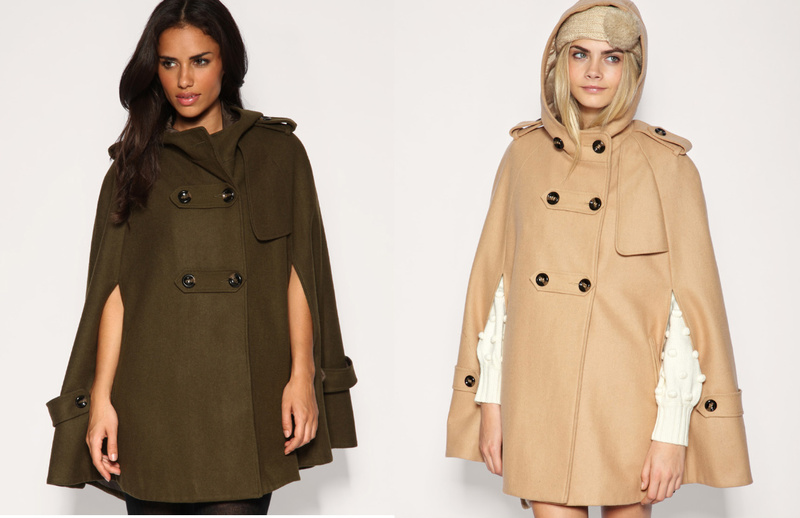 This ASOS Hooded Military Cape. It comes in three different colors and even has a hood for those windy days! I love it- I think it's gorgeous and chic. Seriously contemplating investing in it now that ASOS has a US site. Have you checked out their site yet? How do you feel about capes?? Thumbs UP or Thumbs DOWN? I love a cape! So on-trend this season. Gonna have a little browse on ASOS in a second, think now might be the time to invest in one! Just followed your blog btw.